I figured I'd do something a little different for today's drawing. Taking a wee break from the iPad, and from the comic book, working with good old fashioned pen and paper, and getting some Halloween feels. As I was drawing this, little miss kept coming by and saying "awww!" I've always been a fan of bats, so I'm glad to get her on my side with this cutie. Awww that is a very cute bat indeed! I love her expression and her pose. Well done, Megan :D.
The crearure looks happy and lively. I wish I you could show us your progress shot. Would have enjoyed it more. Thank you! The drawing is really quite small so I didn’t take the time to grab a picture of the sketch before inking it. I’m not doing progress shots for most of my inktober drawings, but typically do for my more involved pieces. Thanks for checking it out! 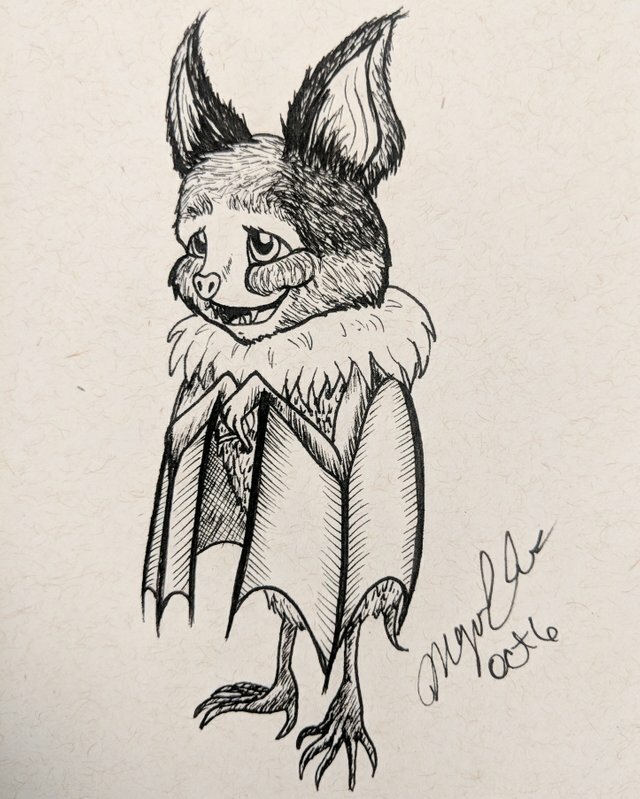 haha It’s a bashful little bat!